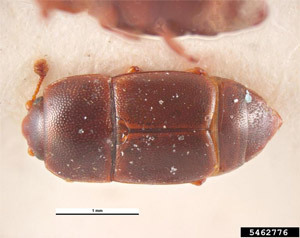 Sap beetles are small beetles with "knobbed" antennae. They aggregate around fully ripened fruit or tree sap, laying eggs in ensuing larval food. Removing rotten fruit from orchards or food bins helps control this pest.